The envelope surface glycoprotein C (gC) of HSV-1 interferes with the complement cascade by binding C3 and activation products C3b, iC3b, and C3c, and by blocking the interaction of C5 and properdin with C3b. Wild-type HSV-1 is resistant to Ab-independent complement neutralization; however, HSV-1 mutant virus lacking gC is highly susceptible to complement resulting in ≥100-fold reduction in virus titer. We evaluated the mechanisms by which complement inhibits HSV-1 gC null virus to better understand how gC protects against complement-mediated neutralization. C8-depleted serum prepared from an HSV-1 and -2 Ab-negative donor neutralized gC null virus comparable to complement-intact serum, indicating that C8 and terminal lytic activity are not required. In contrast, C5-depleted serum from the same donor failed to neutralize gC null virus, supporting a requirement for C5. EDTA-treated serum did not neutralize gC null virus, indicating that complement activation is required. Factor D-depleted and C6-depleted sera neutralized virus, suggesting that the alternative complement pathway and complement components beyond C5 are not required. Complement did not aggregate virus or block attachment to cells. However, complement inhibited infection before early viral gene expression, indicating that complement affects one or more of the following steps in virus replication: virus entry, uncoating, DNA transport to the nucleus, or immediate early gene expression. Therefore, in the absence of gC, HSV-1 is readily inhibited by complement by a C5-dependent mechanism that does not require viral lysis, aggregation, or blocking virus attachment. Complement is an important component of the innate immune system and functions as one of the earliest host responses to viral infection. Complement activation occurs in the presence of Ab, or for some viruses complement activation can be independent of Ab, leading to neutralization of cell-free virus and lysis of virus-infected cells (1, 2). Complement activation by cell-free virus facilitates binding to phagocytic cells (3), whereas complement activation by infected cells promotes leukocyte attachment and cytotoxicity (4, 5). Complement serves as an important bridge between the innate and acquired immune systems by enhancing Ag presentation to follicular dendritic cells and B cells, leading to improved Ab responses to T cell-dependent Ags (6, 7, 8, 9). Viruses have evolved strategies to inhibit host defense activities mediated by complement. Glycoprotein C (gC)4 of HSV-1 and -2, bovine herpes virus type 1, pseudorabies virus, and equine herpes virus types 1 and 4 bind C3b (10, 11, 12, 13). HSV-1 gC also interferes with the binding of C5 and properdin to C3b (14, 15, 16). HSV-1 gC protects the virus and virus-infected cell from Ab-independent complement neutralization and cell lysis (17, 18, 19) and is an important virulence factor in vivo (20, 21). Vaccinia virus complement control protein protects the virus from Ab and complement neutralization, and functions as a virulence factor (22, 23, 24). During replication, some viruses including vaccinia virus, HIV, and CMV incorporate into their envelope cell-derived regulators of complement activation that appear to protect the virus against complement attack (25-29). The mechanism by which complement inhibits infection of cell-free virus in the absence of specific Abs has been determined for several viruses. Envelope glycoproteins of some retroviruses activate complement by binding C1q (30, 31), leading to generation of the membrane attack complex and viral lysis (32), or to enhanced opsonization of complement-coated virions (33, 34). Galα1-3Gal glycosylation carbohydrates on some retroviruses and on lymphocytic choriomeningitis virus glycoproteins bind naturally occurring IgM Abs, resulting in complement activation and virus neutralization (35, 36, 37). Natural Abs and complement also neutralize vesicular stomatitis virus and Newcastle disease virus (37). Vesicular stomatitis virus neutralization requires natural IgM Abs directed against some undefined Ag, other than Galα1-3Gal (38), whereas neutralization of Newcastle disease virus occurs totally independent of Ab (39). We previously reported that seronegative human serum has little effect on neutralizing wild-type HSV-1, resulting in ≤2-fold reduction in titer. However, HSV-1 mutant virus lacking gC is rapidly inhibited by human complement, resulting in 100- to 5000-fold loss of titer, the greater reduction occurring when fresh serum is replenished during the assay (17). Ab is not required for complement-mediated neutralization of gC null virus, although Ab enhances the neutralizing activity (17, 19). We now further examine the mechanisms by which complement neutralizes gC null virus independent of Ab and demonstrate that C5 is required, whereas activation of the terminal lytic components is not, and that complement blocks infection at a step subsequent to virus attachment but before early viral gene expression. Vero and HeLa cells were grown in DMEM and 10% FBS supplemented with 10 mM HEPES buffer solution, 2 mM l-glutamine, and penicillin, streptomycin, and Fungizone (Life Technologies, Rockville, MD). NS-gCnull virus lacks the entire gC protein coding sequence (17). NS-gEnull virus, which has a deletion of gE amino acids 124–508 (40), served as a control for some experiments. NS-gCnull and NS-gEnull viruses were derived from the HSV-1 parental strain, NS, and have gC or gE protein coding sequences replaced by a β-galactosidase expression cassette under the control of the early HSV-1 ICP6 promoter. Viruses were purified from Vero- or HeLa-infected cell extracts on a 5–65% sucrose gradient as described previously (17). Normal human serum (NHS) served as the source of complement and was obtained from an adult subject who is Ab negative for HSV-1 and -2 (17). NHS was prepared from blood that was allowed to clot at room temperature for 10 min, overnight at 4°C, and then serum was separated, aliquoted, and stored at −70°C. 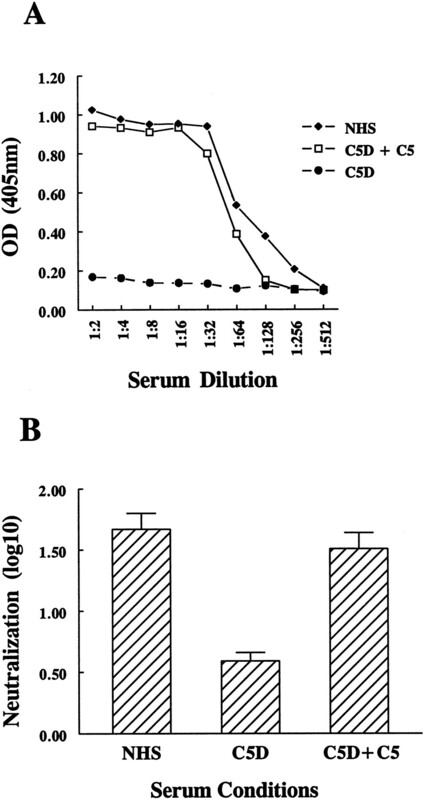 To deplete complement components, EDTA was added to a final concentration of 30 mM, and serum was passed over an anti-C5, anti-C6, anti-C8, or anti-factor D Sepharose column in buffer containing 100 mM sodium phosphate, 100 mM NaCl, 10 mM EDTA, and 0.02% NaN3 at pH 7.4. Immunoadsorbant columns were prepared by coupling IgG fractions of the respective monospecific sheep or goat antiserum, prepared in one of the author’s laboratories (M.K.P. ), to cyanogen bromide-Sepharose (Amersham Pharmacia Biotech, Piscataway, NJ) at a final concentration of 10 mg of IgG/ml of gel. All procedures were conducted on ice or at 4°C. Fractions containing proteins were pooled and concentrated to 80% of the original serum volume by ultrafiltration using membranes with a molecular mass cutoff of 10,000 Da. The material was dialyzed against PBS containing 0.1 mM EDTA to reduce EDTA concentrations and remove sodium azide, and the volume was brought to the original volume with dialysis buffer. Depleted sera were aliquoted and frozen at −70°C. Before use in neutralization assays, sera depleted of complement components were dialyzed again against PBS to remove residual EDTA. Complement-depleted sera were replenished with C5, C6, or C8 (Sigma, St. Louis, MO) at 75 μg/ml for C5, 60 μg/ml for C6, and 80 μg/ml for C8. Factor D was kindly provided by J. Volanakis and used at 37 μg/ml. For some experiments, an additional method was used to deplete C8 from NHS by treating NHS with a 1:5 dilution of rabbit anti-human C8 prepared using purified C8 as immunogen. Purified virus was incubated with HSV Ab-negative NHS as source of complement, or with NHS treated with 10 mM EDTA or heated to 56°C for 30 min to inhibit activation of the complement cascade. Neutralization was performed using 104–105 PFU of virus that was incubated with 50% serum (final concentration) for 1 h at 37°C (17). For some experiments, serum depleted of C5, C6, C8, or factor D was used as the source of complement. For experiments evaluating whether natural Abs to Galα1-3Gal are involved in neutralization, the disaccharide Galα1-3Gal (Sigma), or sucrose as a control, was added at a final concentration of 5 mg/ml to the virus and NHS mixture (37). Virus titers were determined by plaque assay on Vero cells. Neutralization results are expressed as the difference in titer (log10) between virus incubated with EDTA-serum and the experimental serum. Sera were tested for total hemolytic complement activity (CH50) using Ab-sensitized sheep erythrocytes that were prepared according to the manufacturer’s directions (Sigma) and incubated with serial 2-fold dilutions of serum for 1 h at 37°C in 96-well microtiter plates (17, 41). The plate was centrifuged for 3 min at 120 × g, the supernatant was transferred to a fresh plate, and the extent of hemolysis was measured by spectrophotometry at 405 nm. Alternative complement pathway activity was measured using rabbit erythrocytes (Cocalico, Reamstown, PA) that were washed with PBS followed by veronal- buffered saline containing 8 mM EGTA and 2 mM Mg2+. Erythrocytes at 2 × 106/well in a 96-well microtiter plate were incubated with serial 2-fold dilutions of serum for 1 h at 37°C, and the extent of hemolysis was read by spectrophotometry at 405 nm. The affinity chromatography procedure used to deplete complement proteins resulted in an approximate 25% dilution of serum proteins. To account for the dilution, the total protein concentrations of complement-depleted serum and NHS was adjusted to comparable levels as determined by the bicinchoninic acid protein assay (Pierce, Rockford, IL). To determine whether Vero cells secrete C8, experiments were performed in which conditioned medium was removed from 24-h Vero cell cultures. The conditioned medium was concentrated 50-fold by Centricon 50 filtration (Amicon, Beverly, MA) and used to supplement C8-depleted serum in a CH50 assay. A total of105 PFU of purified NS-gCnull virus was incubated with an equal volume of NHS or EDTA-treated serum for 1 h at 37°C. The virus-serum mixture was then placed on ice until treated with 2% phosphotungstic acid (pH 6.5) and placed on a 200-mesh copper grid coated with formvar and carbon. Grids were treated with 1 μg/ml poly-l-lysine for 1 min before use (42). Size of virions measured by sucrose gradient ultracentrifugation. Purified NS or NS-gCnull virus was labeled with [35S]methionine and cysteine (ICN Biomedicals, Costa Mesa, CA), incubated with NHS or EDTA-treated serum for 1 h at 37°C, and sedimented on a 5–65% sucrose gradient (20). Fractions of 0.5 ml were collected and radiolabeled counts were determined in each fraction. NS-gCnull virus was radiolabeled with [35S]methionine and cysteine,and purified on a 5–65% sucrose gradient (20). Virus was incubated for 1 h at 37°C with NHS or serum that was heat inactivated for 30 min at 56°C and then added to Vero cells at 4°C for 1–6 h. Heat treatment was used to inactivate complement to avoid dislodging the cell monolayer with EDTA. Cells were washed with PBS, removed using virion lysis buffer [10 mM Tris (pH 8.0), 10 mM EDTA, and 0.25% Triton X-100], and placed in Ecolume (ICN Biomedicals) scintillation fluid. The percent bound counts was calculated as [counts bound to the monolayer/total counts added] × 100%. A total of 104 NS-gCnull, or NS-gEnull virus as a control, was incubated for 1 h at 37°C with 50% NHS or NHS heated to 56°C for 30 min. Virus was added to Vero cells in 48-well plates for 1 h at 37°C, washed with PBS, and cells were assayed for β-galactosidase expression at 20 h postinfection by adding 20% Nonidet P-40 to 300 μl of media, mixing by pipeting, and replacing 100 μl of media with chlorophenol-β-d-galactopyranoside monosodium salt (Roche Diagnostic Systems, Indianapolis, IN) (43). The 20-h time point was chosen based on pilot experiments in which samples were assayed beginning 5 h postinfection. At the low multiplicity of infection used in these experiments (0.05 PFU/cell), β-galactosidase expression was detected at 5 h; however, levels were considerably greater by 20 h. For some experiments, Vero cells, rather than virus, were incubated with 50% NHS or heat-inactivated NHS for 1 h at 37°C, washed, and infected with NS-gCnull or NS-gEnull virus at an infection ratio of 1 PFU of virus/cell for 1 h at 37°C. The inoculum was removed by washing and β-galactosidase expression was measured 20 h after infection. Results are expressed as percent β-galactosidase expression comparing virus or cells treated with active complement vs inactive complement. We previously reported that HSV Ab-negative NHS inhibits infection by gC null virus while having little affect on wild-type virus; therefore, gC null virus was used to evaluate the mechanisms of complement-mediated neutralization (17, 21). C8 is required for pore formation and generation of the terminal lytic complex (44). Experiments were performed using C8-depleted serum to assess the importance of complement-mediated viral lysis. Depletion of C8 resulted in loss of NHS hemolytic activity, which was restored by reconstituting with C8 (Fig. 1⇓A). NHS neutralized gC null virus 1.4 log10. The somewhat lower neutralization than previously reported (≥2 log10) (17) can be explained by the dilution of NHS to adjust total protein concentrations to match those of complement-depleted sera. 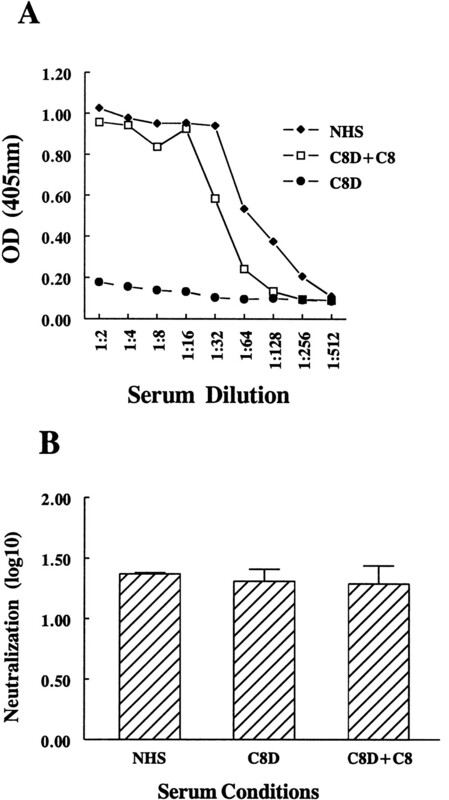 Comparable neutralization results were obtained using C8-depleted serum or C8-depleted serum restored using physiologic C8 concentrations (Fig. 1⇓B). These results suggest that neutralization of gC null virus does not require C8, membrane pore formation, or viral lysis. A, Total hemolytic complement activity of NHS, the same serum depleted of C8, and C8-depleted (C8D) serum reconstituted with physiologic concentrations of C8. Depleting C8 leads to loss of hemolytic activity, whereas replacing C8 restores hemolytic activity to wild-type levels. B, Neutralization of gC null virus using sera shown in A. Each serum resulted in comparable levels of neutralization. Results shown represent the difference in titer (log10) comparing NHS, C8- depleted serum, or C8-depleted serum + C8 with the same sera treated with EDTA. NHS was diluted to contain total protein concentrations comparable to C8-depleted serum. NHS is the average of two determinations, C8 depleted and C8 depleted + C8 are the mean and SEM of three determinations. One potential explanation for the C8-depleted serum result is that Vero cells used in the neutralization assay may synthesize C8 and replenish this missing factor (45). To evaluate for this possibility, Vero cell-conditioned medium was harvested, concentrated 50-fold, and added to C8-depleted serum to determine whether hemolytic activity was restored. This treatment had no effect on hemolytic activity. As further proof that C8 is not required, NHS was incubated with anti-C8 Ab. This Ab reduced the hemolytic activity of serum (CH50 titer < 1:2), yet it did not block complement neutralization mediated by C8-depleted serum. These results indicate that C8 is not required for complement neutralization of gC null virus. We previously reported that C4 is required for Ab-independent complement neutralization of gC null virus (17). The high concentrations of C3 in NHS make it difficult to deplete C3; therefore, we next evaluated whether C5 is required. The CH50 of C5-depleted NHS was <1:2. 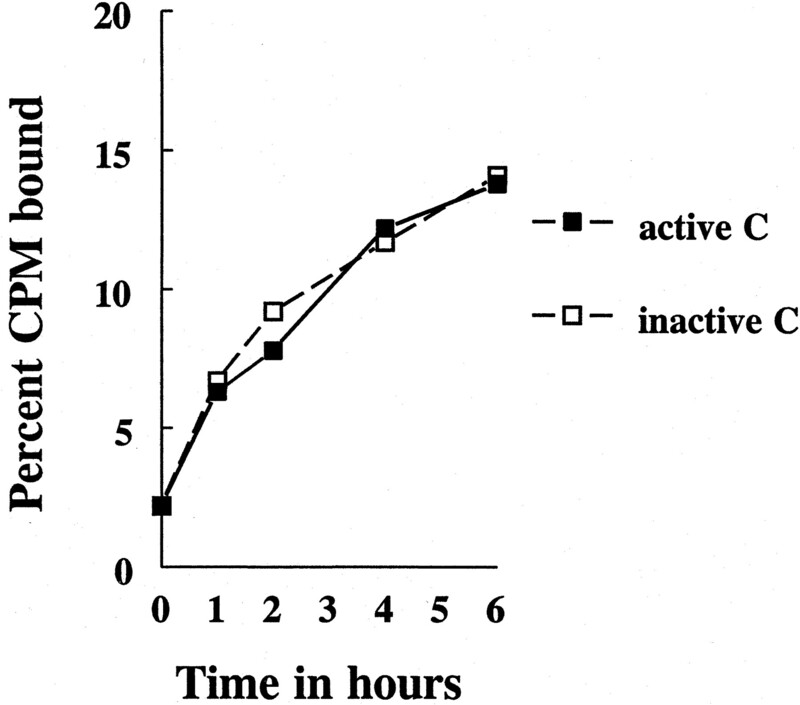 Hemolytic activity was restored when C5 was replenished to physiologic concentrations (Fig. 2⇓A). gC null virus was incubated with NHS, C5-depleted serum, or C5-reconstituted serum (Fig. 2⇓B). The C5-depleted serum was significantly impaired in its ability to neutralize gC null virus (p < 0.002 comparing C5 depleted and NHS; p < 0.004 comparing C5-depleted and C5-depleted + C5-replenished serum), indicating that C5 is required. C5 is present in EDTA-treated serum, yet this serum is not capable of neutralizing gC null virus; therefore, complement activation and cleavage of C5 are required for neutralization. The fact that C5-depleted serum neutralized gC null virus ∼0.5 log10 (3-fold) suggests that C1, C4, C2, and C3 have some neutralizing activity even in the absence of C5. 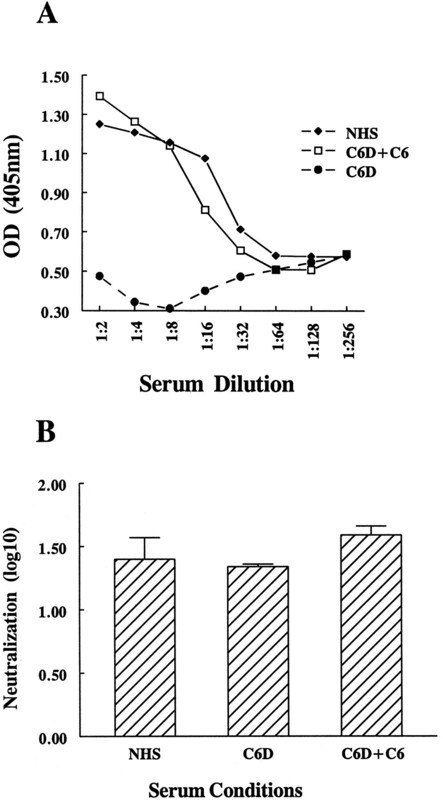 A, Total hemolytic complement activity of NHS, the same serum depleted of C5, and C5-depleted (C5D) serum replenished with physiologic concentrations of C5. Depleting C5 results in loss of hemolytic activity, whereas replenishing C5 restores hemolytic activity. B, Complement neutralization mediated by sera shown in A. C5-depleted serum has reduced neutralizing activity compared with NHS or C5 depleted + C5 serum. Results shown represent the difference in titer (log10) comparing NHS, C5-depleted serum, C5-depleted serum + C5 with the same sera treated with EDTA. NHS was diluted to contain protein concentrations comparable to C5-depleted serum. Each serum is the mean and SEM of three determinations. The CH50 of C6-depleted serum was <1:2, which was restored using physiologic concentrations of C6 (Fig. 3⇓A). Neutralization assays with C6-depleted and C6-replenished sera demonstrated that C6 is not required for neutralization of gC null virus (Fig. 3⇓B). Along with results using C5-and C8-depleted sera, the findings indicate that complement components beyond C5 (C6 through C9) are not essential for neutralization of gC null virus. A, Total hemolytic complement activity of NHS, the same serum depleted of C6, and C6-depleted (C6D) serum replenished with physiologic concentrations of C6. Depleting C6 resulted in loss of hemolytic activity, whereas replenishing C6 restored hemolytic activity. B, Complement neutralization assays demonstrate that C6-depleted serum retains neutralizing activity. Results shown represent the difference in titer (log10) comparing NHS, C6-depleted serum, C6-depleted serum + C6 with the same sera treated with EDTA. NHS was diluted to contain protein concentrations comparable to C6-depleted serum. Each serum is the average of two determinations. The alternative complement pathway was inactivated by depleting factor D. Fig. 4⇓A shows that alternative pathway hemolytic activity of factor D-depleted serum was <1:2, which was restored when factor D was replenished. Fig. 4⇓B demonstrates that factor D-depleted serum is capable of neutralizing gC null virus, indicating that participation of the alternative complement pathway is not essential. A, Alternative pathway hemolytic activity of NHS, the same serum depleted of factor D, and factor D-depleted (D depl.) 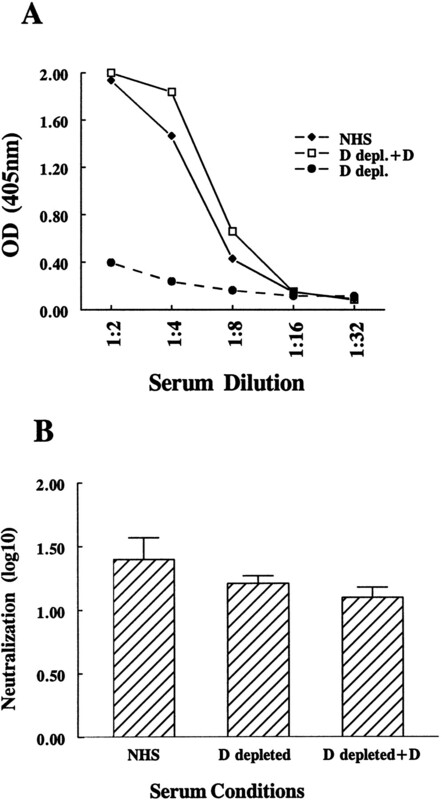 serum replenished with factor D. Depleting factor D resulted in loss of alternative pathway hemolytic activity, while replenishing factor D restored hemolytic activity. B, Complement neutralization assays demonstrate that factor D-depleted serum retains neutralizing activity. Results shown represent the difference in titer (log10) comparing NHS, factor D-depleted serum, or factor D-deleted serum + factor D with the same sera treated with EDTA. NHS was diluted to contain protein concentrations comparable to factor D-depleted serum. Each serum is the average of two determinations. Several viruses, including some retroviruses and lymphocytic choriomeningitis virus, are neutralized by complement in the absence of specific Abs; however, naturally occurring Abs to Galα1-3Gal disaccharides on the virus are required for complement-dependent virus neutralization (36, 37, 39, 46). Two approaches were taken to evaluate the role of Galα1-3Gal Abs in gC null virus neutralization. First, virus was purified in HeLa cells, which do not express a functional α1–3-galactosyltransferase enzyme needed to add Galα1-3Gal onto glycoproteins or glycolipids (37). Although neutralization was somewhat less for HeLa-derived virus than Vero-derived virus (Fig. 5⇓A), complement neutralized virus grown in HeLa cells, indicating that Ab to Galα1-3Gal is not required. Second, Galα1-3Gal was added to the neutralization reaction to competitively inhibit naturally occurring Abs to Galα1-3Gal, if present. The Galα1-3Gal disaccharide did not inhibit gC null virus neutralization, since results were similar when sucrose or no disaccharide inhibitor was used as controls (Fig. 5⇓B). These results suggest that naturally occurring Abs to Galα1-3Gal are not involved in neutralization of gC null virus. A, Natural Abs to Galα1-3Gal are not required for complement neutralization. gC null virus was grown in HeLa cells, which have been shown to lack the α1–3-galactosyltransferase enzyme (37 ), or in Vero cells. Although neutralization of virus grown in HeLa cells was somewhat less than in Vero cells, complement neutralized virus grown in each cell type. B, Galα1-3Gal disaccharide was added to the neutralization reaction to competitively inhibit naturally occurring Abs, if present. As controls, sucrose or no disaccharide was added. Galα1-3Gal (labeled as Gal-3Gal in this figure) did not inhibit neutralization. Each experiment is the average of two determinations. The results indicate that virus neutralization requires complement activation that includes C5, but not C6 or C8, and that an intact alternative complement pathway is not essential. We evaluated whether complement activation results in virus aggregation, since large aggregates could lower virus titers measured in a plaque assay because each aggregate would score as one virus particle. Purified gC null virus was incubated with NHS or EDTA-treated serum as a control and examined by scanning electron microscopy for viral aggregates. The largest aggregates detected are shown in Fig. 6⇓ and contained seven or fewer virus particles. Most virus particles seen by electron microscopy were not aggregated. Importantly, no differences were noted between NHS and EDTA-treated serum. This number of particles, even in the largest aggregates, is too few to explain the approximate 25-fold (1.4 log10) reduction in titer detected following neutralization with diluted NHS ( Figs. 1–4⇑⇑⇑⇑) or the 100-fold (2.0 log10) reduction seen when NHS is used undiluted (Ref. 17 ; Fig. 5⇑), as it was in this experiment. 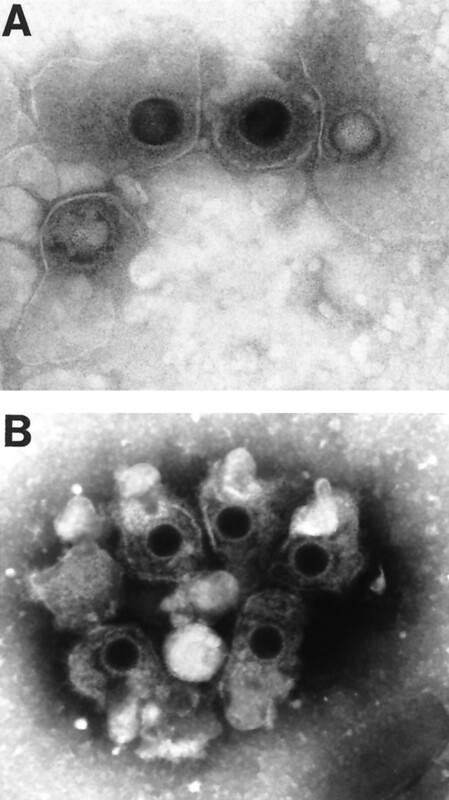 Electron microscopy showing HSV-1 gC null virus incubated with NHS (A) or EDTA-treated serum (B). The largest aggregates detected on the grid are shown. A similar number and size of aggregates were detected when virus was incubated with either serum, indicating that virus aggregation does not account for NHS neutralizing activity. To further evaluate for complement-induced viral aggregation, radiolabeled purified wild-type virus, NS, or gC null virus was incubated with NHS or EDTA-treated serum, and the position of virus bands was determined on a 5–65% sucrose gradient. Aggregates should increase the size of the particles, resulting in a shift of radiolabeled counts toward the bottom of the gradient (higher fraction numbers). For these experiments, we compared NS with NS-gCnull virus so that we would be controlling for the effects that complement may have on virus sedimentation because of coating the virus. Small differences were detected comparing the two viruses; however, the differences were in the opposite direction than expected for aggregation, with a shift in NS-gCnull virus counts toward the top of the gradient (Fig. 7⇓A). When both viruses were incubated with EDTA-treated serum, no differences were detected (Fig. 7⇓B). As an additional control, gC null virus was lysed with detergent or incubated with HSV immune serum as the source of Ab and complement. As expected, viral lysis resulted in radioactive counts moving toward the top of the gradient, whereas Ab and complement shifted the counts toward the bottom of the gradient (Fig. 7⇓C). We interpret the results to indicate that complement does not aggregate gC null virus and that little if any viral lysis occurs with NHS or with Ab plus complement based on the position of radioactive counts in the gradient. Sucrose gradient ultracentrifugation of NS and NS-gCnull viruses. A, NS or NS-gCnull virus was incubated with NHS and placed on a 5–65% sucrose gradient. Fractions (0.5 ml) were collected. Results are the mean and SEM of four experiments and are expressed as percentage of total counts detected in each fraction. Radioactive counts for gC null virus were shifted slightly toward the top of the gradient, although the differences between the two viruses were not statistically significant (fraction 1, p = 0.29; fraction 6, p = 0.11). Shifts for gC null virus to the top of the gradient are in the opposite direction expected for aggregates. B, NS and NS-gCnull viruses were incubated with EDTA-treated serum. Results are the mean ± SEM of four separate experiments. No differences are detected between the two viruses. C, As controls, gC null virus was lysed with detergent or incubated with serum containing high titer Ab to HSV plus complement. Lysis resulted in a shift of radioactive counts to the top of the gradient, whereas Ab and complement shifted counts toward the bottom of the gradient, indicating coating of virus with Ab and complement or formation of viral aggregates. The experiment in C was performed once. Complement activation can lead to coating of virus with complement proteins that can block virus attachment to cells. Experiments were performed to determine whether NHS blocks attachment of gC null virus. No differences were detected in virus attachment assays comparing gC null virus incubated with NHS or heat-inactivated serum (Fig. 8⇓), indicating that neutralization of gC null virus cannot be explained by the effect of complement blocking virus attachment. Attachment assay to measure binding of 35S-labeled HSV-1 gC null virus to Vero cells. No differences in kinetics or extent of binding were detected comparing NHS and heat-inactivated serum. We previously reported that the NS-gEnull mutant virus resists neutralization by NHS to an extent comparable to wild-type virus (21). NS-gCnull and NS-gEnull viruses have the gC and gE protein coding sequences, respectively, replaced by a β-galactosidase expression cassette (17, 41). Viruses were incubated with heat-inactivated serum and compared for β-galactosidase expression. β-galactosidase expression differed by ∼2-fold comparing the two mutant viruses; therefore, for ease of comparison, we chose to present results as percent β-galactosidase expression in which each virus is compared with itself to calculate the effects of complement. When NS-gEnull virus was incubated with NHS, β-galactosidase levels were reduced to 37.3 ± 0.6 compared with 44.5 ± 9.6 for heat-inactivated serum (88% of heated complement levels). In contrast, when NS-gCnull virus was incubated with NHS, β-galactosidase expression was reduced to 3.5 ± 0.5 compared with 97.6 ± 24.7 for heat-inactivated serum (3% of heated complement levels) (Fig. 9⇓A). These results indicate that complement blocks gC null virus infection at a step before early gene expression. Detection of HSV-1 early gene expression comparing gC null and gE null viruses. These HSV-1 mutant viruses contain the β-galactosidase expression cassette under the control of the HSV-1 ICP6 early promoter. This cassette replaces gC or gE protein coding sequences. A, Viruses were incubated with NHS or heat-inactivated serum for 1 h at 37°C and then added to Vero cells. Twenty hours later, β-galactosidase expression was measured as a marker of early gene expression. Results compare β-galactosidase expression of virus incubated with NHS and heat-inactivated serum. Values for heat-inactivated serum were set at 100%. NHS markedly reduces β-galactosidase expression of gC null virus, while having little effect on gE null virus. B, Cells, rather than viruses, were incubated with NHS or heat-inactivated serum for 1 h at 37°C and then infected with HSV-1 gC null or gE null virus. Twenty hours later, β-galactosidase expression was measured as a marker of early gene expression. Results shown compare β-galactosidase expression of cells incubated with NHS and heat-inactivated serum, where values for heat-inactivated serum were set at 100%. No differences between gC null and gE null virus were detected, indicating that complement does not mediate its effect by inhibiting cell susceptibility to infection. Experiments were performed to determine whether complement inhibits infection by modifying the cells used to measure β-galactosidase expression. Vero cells were incubated with NHS for 1 h before infection with NS-gCnull or NS-gEnull viruses. β-galactosidase expression was not affected (Fig. 9⇑B), indicating that complement has its effect on the virus and not the cell. Complement may interact with specific Abs to neutralize virus by several mechanisms, including coating virus to block attachment, promoting viral lysis, aggregating virus, or enhancing virus attachment to complement and IgG Fc receptors on phagocytic cells (47). In the absence of specific Abs, complement may also neutralize certain viruses (Table I⇓). Neutralization of HSV-1 gC null virus requires C5, but not C6 or C8, which establishes that terminal lytic complement components are unnecessary. Neutralization assays were conducted in the absence of phagocytic cells bearing complement receptors; therefore, enhanced opsonization cannot account for complement-mediated neutralization (3). In this report, we found no evidence that natural Abs to Galα1-3Gal are involved in virus neutralization. We previously reported that neutralization occurs in hypogammaglobulinemic human serum, suggesting that natural Abs directed at other, unidentified, epitopes are not involved (17). We now report that complement has no effect on the blocking virus attachment or on aggregating gC null virus; therefore, the mechanisms by which complement neutralizes HSV-1 gC null virus differ from those reported for other viruses either in the presence or absence of specific Abs. The fact that gC inhibits complement neutralization helps explain why gC is conserved in viruses isolated from clinical samples (51, 52), with rare exception (53), despite the finding that gC is nonessential for virus replication in vitro (54). gC promotes virus attachment to cells by binding to cell surface heparan sulfate (55, 56). Glycosaminoglycans, including heparan sulfate, are inhibitors of complement activation which is thought to occur by inhibiting C1q binding and enhancing C1 inhibitor activity (57). Therefore, gC directly inhibits complement activation through its complement-interacting domains and may indirectly inhibit complement activation by its proximity to heparan sulfate. We previously reported that gC has two complement-interacting domains, a C3-binding region in the center of the molecule, and an amino-terminal domain that interferes with C5 and properdin binding to C3b (15, 16, 21). Our current result helps explain why gC blocks C5 binding, since C5 is essential for virus neutralization. However, we show that the alternative complement pathway is not required for virus neutralization. Why then does gC block properdin binding to C3b? In the present study, we evaluated Ab-independent virus neutralization, but did not examine the additive effects of Ab or complement lysis of infected cells. We previously showed that the alternative complement pathway is required for lysis of infected cells (19). Perhaps the interaction between gC and properdin is important for blocking this effect or blocking Ab and complement neutralization. The native C5 molecule in EDTA serum has no effect on virus neutralization; therefore, C5 must be cleaved to C5a and C5b by complement activation. We showed that alternative complement pathway activation is not required, while Ca2+ is essential since neutralization does not occur using EDTA or Mg2+-EGTA serum (17). To activate C5 requires C1 (or the lectin pathway), C4, C2, and C3, suggesting that each of these proteins is needed for neutralization of gC null virus. Which molecules on HSV-1 initiate activation of the complement cascade and how activated C5 mediates virus neutralization remain to be determined. One possible explanation is that activated C5 may interfere with one or more HSV glycoproteins essential for virus entry (Fig. 10⇓). Another possibility is that activated C5 blocks the interaction between the virus and cell surface molecules that trigger intracellular events necessary for viral replication. For example, viral glycoproteins may interact with cell surface molecules and trigger intracellular signals that promote virus-cell fusion, uncoating, transport of viral DNA to the nucleus, or initiation of viral gene expression. Activated C5 on the virus may block one or more of these activities. Future studies that address whether activated C5 modifies virus entry or interferes with subsequent steps in the virus replication cycle will help to define the complex interactions between virus and the innate immune system. Model of possible mechanisms for complement neutralization of HSV-1. An undefined molecule on the virion envelope activates complement leading to C3b fixation and generation of C5b, a cleavage product of C5. A, In the absence of gC, C5b binds to C3b and interferes with the activity of one or more of the viral glycoproteins essential for virus entry. Other possibilities not shown in the model are that C5b may interfere with the ability of HSV-1 to trigger intracellular signals required for virus uncoating, DNA transport to the nucleus, or gene expression. B, gC regions I to IV bind to C3b, while amino acids 33–123 at the amino terminus block the binding of C5b to C3b. By interfering with C5b binding, gC prevents C5b from modifying the activity of viral glycoproteins essential for virus entry or for stimulating intracellular signals that support virus replication. We thank Dr. Gerd Maul from the Microscopy Core Facility (Wistar Institute, Philadelphia, PA) for performing the electron microscopy studies, and Drs. Gary Cohen and Roselyn Eisenberg from the University of Pennsylvania for assistance with the β-galactosidase assay. ↵1 This work was supported by Public Health Service Grants HL 28220, AI 33063, and DK-35081. ↵3 Current address: Schering Plow, 2015 Galloping Hill Road, Kenilworth, NJ 07033. ↵4 Abbreviations used in this paper: gC, glycoprotein C; gE, glycoprotein E, NHS, normal human serum. Nagashunmugam, T., J. Lubinski, L. Wang, L. T. Goldstein, B. S. Weeks, P. Sundaresan, E. H. Kang, G. Dubin, and H. M. Friedman. 1998. In vivo immune evasion mediated by the herpes simplex virus type 1 immunoglobulin G Fc receptor. J. Virol. 5351.
Cooper, N. R., and G. R. Nemerow. 1986. Complement-dependent mechanisms of virus neutralization. In Immunobiology of the Complement System: An Introduction for Research and Clinical Medicine. G. D. Ross, ed. Academic Press, New York, p.139.